In association with Concerts SA, iSupport Music Business and Jazzy Rainbow present prolific pianist and composer Sibusiso Mash Mashiloane who be performing a homage to his musical legends at The Jazzy Rainbow on Saturday 30 June at 7pm. Tickets are R80 and available at the door and include a free drink. For this performance Sibusiso Mash Mashiloane will be presenting some of the finest music composed by legendary musicians: Zim Ngqawana, Andile Yenana, Moses Taiwa Molelekwa and Bheki Mseleku. Mashiloane has a long-term view of conscientising Africans about the value of their own works and aims to breed a new de-colonised generation of musicians, music collectors and live music audiences who will pride themselves about their own African heritage. “I feel honored to get an opportunity to pay tribute to my legends. This is the music I grew up with, that influenced me and coming from the composers that I respect so much. I want to make sure these compositions will never be forgotten. It is our heritage that must be preserved.” Says Mashiloane. Joining Mashiloane on stage will be Brydon Bolton on bass guitar, Mandla Mlangeni on Trumpet and Kabelo Mokhatla on drums. This performance by Sibusiso Mashiloane is part of the Concerts SA Venue Circuit which aims to foster a love and support for live music in our communities, as well as anchor small and medium sized venues in urban and rural Gauteng, KwaZulu-Natal, and the Western Cape. Yusuf Cat Stevens Jhb and Durban concert tickets on sale. 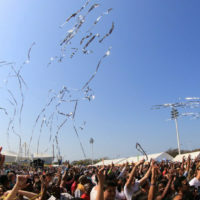 Durban Day Rocked – PICS! !